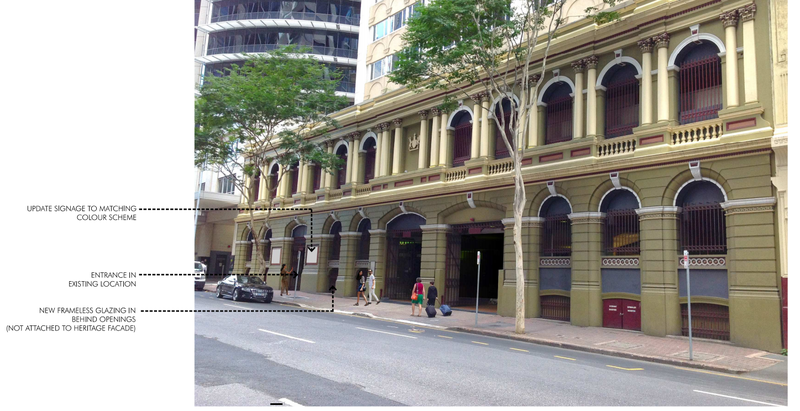 Cromwell Property Group has lodged a development application for student accommodation totalling 915 rooms across two towers at 17 storeys each, located at 154 Mary Street & 147- 163 Charlotte Streets, Brisbane City. The application follows Cromwell's acquisition of the two buildings Health & Forestry House for $65 million in 2013, which is currently 100 per cent leased to the Queensland State Government, opening up uses for government-leased buildings as 1 William Street nears completion where government workers will be centralised. The DA outlines a total site area of 3449 sqm with plans to refurbish the existing building on the site for the purpose of an off-site student accommodation development, which is to be managed by a development company who is committed to the provision of high quality student accommodation. Demolition will be contained internally only. 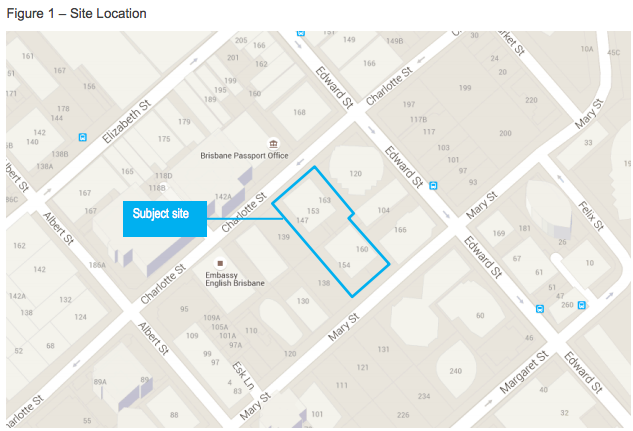 The location of the site at 154 Mary Street, 147-163 Charlotte Street is considered to be optimally suited for student accommodation given the access to all necessary services, a number of educational institutions and transport infrastructure. 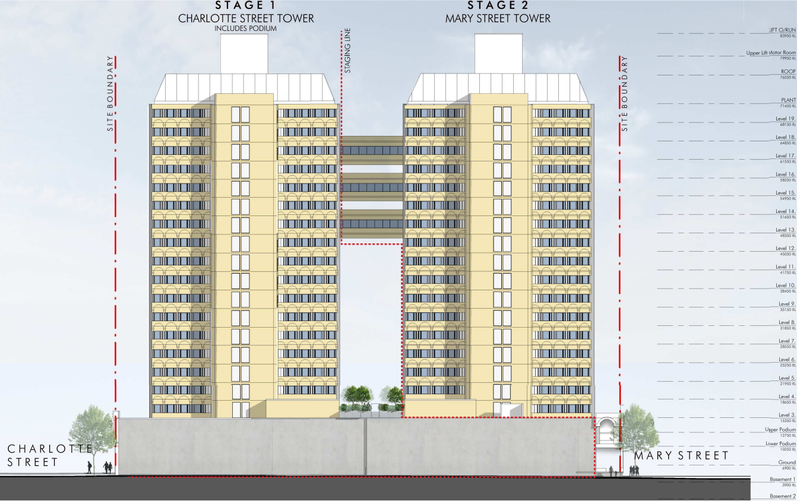 Phase one of the development involves building work to retrofit the tower elements following the demolition of internal fittings only. Phase two of the development will seek approval for the advancement of podium elements including ground level retail tenancies (mall) and basement car park. The current application is solely concerned with the phase one development. The towers will include facilities such as studies, pool tables, a gym, kitchens, karaoke rooms, BBQ areas, media rooms; multi-function spaces and an outdoor terrace. While the entire site falls within the Heritage Overlay, the façade is the only heritage fabric remaining on the site, as referenced in the heritage citation. 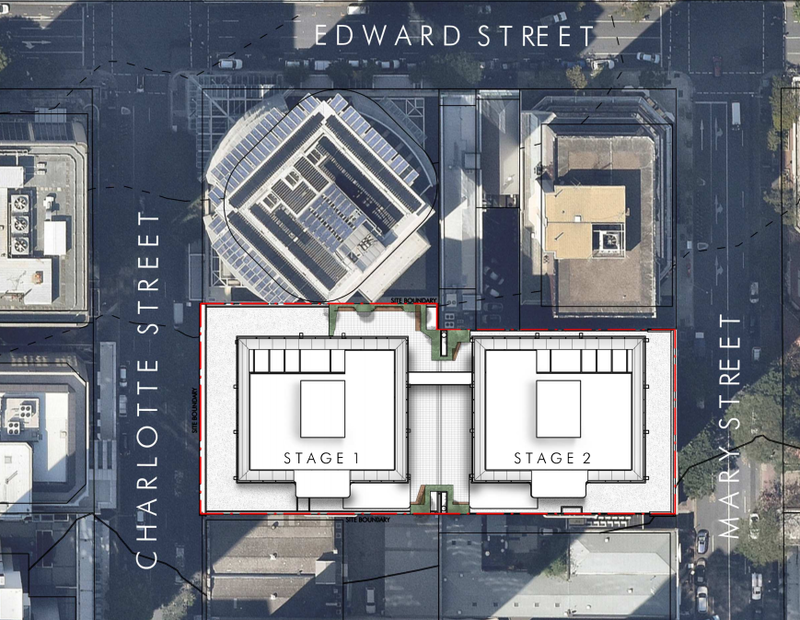 It is understood that during the construction of the current buildings, the balance of the Walter Reid Building was demolished and the façade being retained in order to provide an interpretation of the former warehousing district that Charlotte St was in the 1880’s. The proposed Phase 1 works do not involve any alterations or impacts to the Walter Reid Building Façade. All demolition works on site involved in the removal of the office features in the towers falls within the prescribed exempt development parameters of the Planning Scheme. With office vacancy rated in the Brisbane CBD hovering at around 15%, the market is preparing for the long expected influx of supply in 2016. As the Queensland Government prepares to centralise workers in the new 1 William Street development, an opportunity exists to ‘rebalance’ the B grade CBD office market and breathe new life into a part of the City where a greater diversity of land uses is desirable. The two towers were built in 1984 (Health House) and 1987 (Forestry House), and are typical of government buildings constructed at this time. They are well positioned only one block outside of Brisbane’s premier financial district, known as ‘the Golden Triangle’. 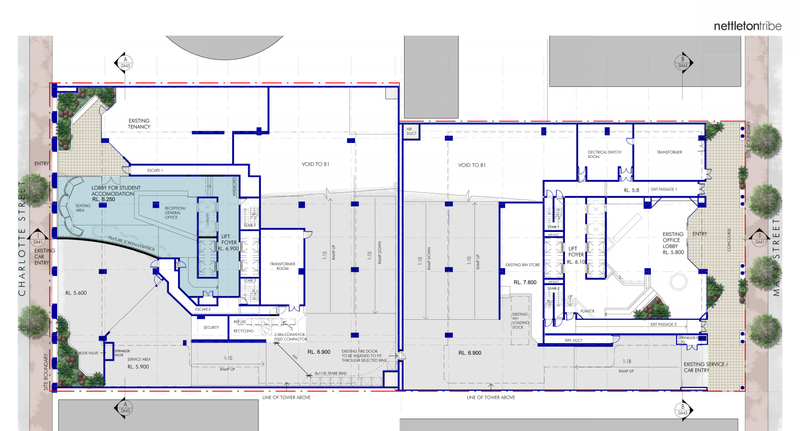 The buildings are joined by three ‘air bridges’ at levels 13, 15 and 17, as well as a raised courtyard on level three. The towers, with a combined net lettable area of 26,782 square metres, are 100% leased to the Queensland Government and are located on a 3,449 square metre parcel of land.